Silchar, Apr 28 : Goods-laden trucks and other vehicles were not allowed to enter Mizoram from 5am on Monday due to an indefinite economic blockade called by several Assam-based NGOs. Hundreds of trucks were stranded on either side of the inter-state border between Assam and Mizoram at Lailapur along NH-306 in Cachar district and at Ramnathpur and Jamira along NH-154 in Assam's Hailakandi district. Hundreds of members of Silchar-based NGO, Forum for Protection of non-Mizos, All Cachar Karimganj Hailakandi Students Association, Krishak Mukti Sangram Samiti (KMSS) and civil society groups put up the blockade on the two highways connecting Assam with Mizoram from Monday morning. They also staged protests against alleged atrocities on non-Mizo traders and workers in Mizoram by some NGOs there. Mihir Lal Roy, an activist, said hundreds of non-Mizos have fled Mizoram due to harassment over the last few weeks. The victims hailed from Assam and were engaged in trade and other jobs in Mizoram under valid permit. Roy said non-Mizos, particularly those from Barak Valley areas of Assam, are subjected to intimidation and cruelty of various forms in Mizoram. 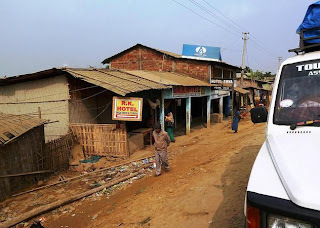 He said it has come to their notice that traders from Barak Valley region are targeted, attacked, threatened and physically harassed and asked by Mizo students and youth leaders to leave the state. The traders are also forced to shut shop, he added. He added there are instances that business establishments owned by non-Mizos are looted by the miscreants and there have been no effort on the part of the administration to check such activities. Congress MLA (South Karimganj) Siddique Ahmed, who joined the agitators at Ramnathpur, said the indefinite economic blockade would continue until the harassment on non-Mizos is stopped and normalcy restored in Mizoram. A senior police officer said so far the agitation is going on peacefully and there was no report of any untoward incident.